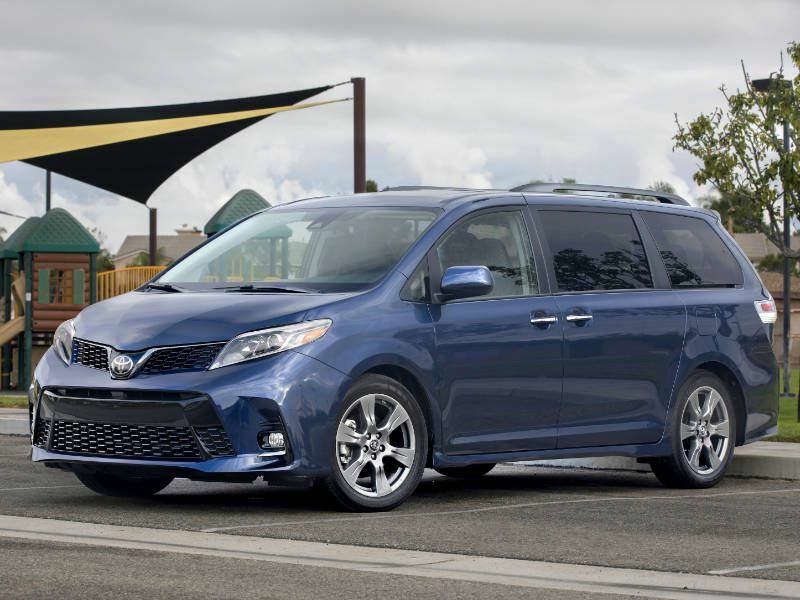 Despite the ever-increasing popularity of SUVs, the minivan market continues to chug along, and America’s best-selling family truckster for the past two years has been the Toyota Sienna. 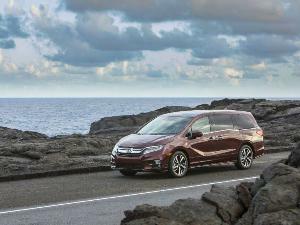 To keep it ahead of the minivan pack, which includes the Honda Odyssey, Kia Sedona, Chrysler Pacifica, and Mercedes-Benz Metris, the 2018 Sienna has received a long list of improvements including a more aggressive look and upgrades in infotainment and safety. 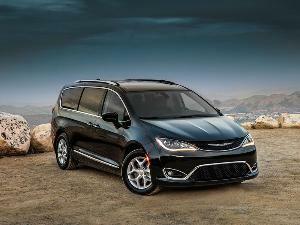 This large eight-passenger minivan, which is now in its third generation, offers extreme comfort and functionality, and it’s powered by the most powerful V6 engine in its class with nearly 300 horsepower. The 2018 Toyota Sienna is also the only minivan on the market that offers all-wheel drive. 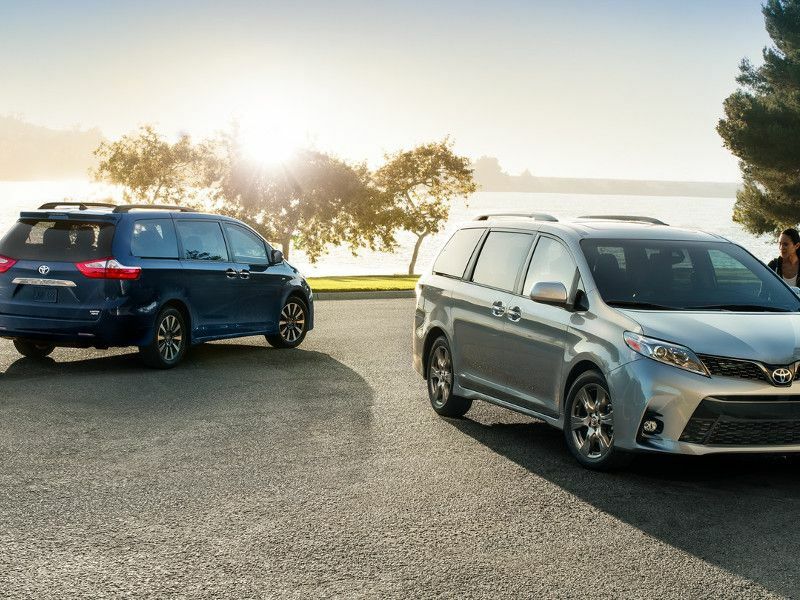 Toyota builds the 2018 Sienna in Princeton, Indiana, and offers it in five trim levels: L, LE, the sporty SE, XLE, and the luxurious Limited. All-wheel drive is available on the LE, XLE, and Limited models for an additional $2,540. Prices start at $31,745, including $995 delivery fee, for the L and max out at over $46,000 for the Limited with all-wheel drive. Standard features on the L include keyless entry, 17-inch wheels, a three-zone climate control system, a backup camera, and two second-row captain’s chairs, which make third-row access much easier but limit seating to seven. The LE, SE and XLE trims add onboard Wi-Fi. Our all-wheel drive XLE test vehicle was a seven-passenger model with a sticker price of $42,055. 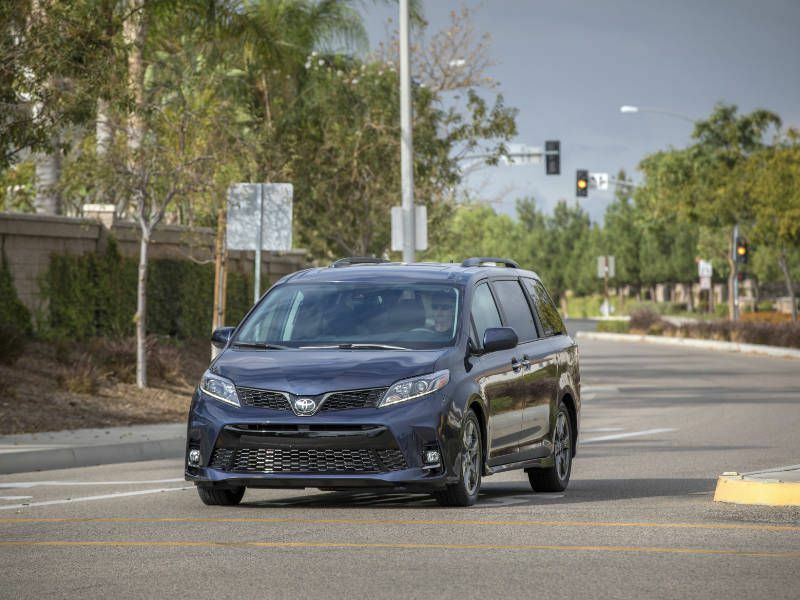 For 2018, every Sienna now comes standard with a longer list of active safety systems, including a pre-collision system with pedestrian detection, all-speed radar-based cruise control, a lane-departure alert with steering assist, and automatic high beams. All Siennas use a 296-hp 3.5-liter V6 and a smooth-shifting eight-speed automatic transmission, which makes it the most powerful minivan available. 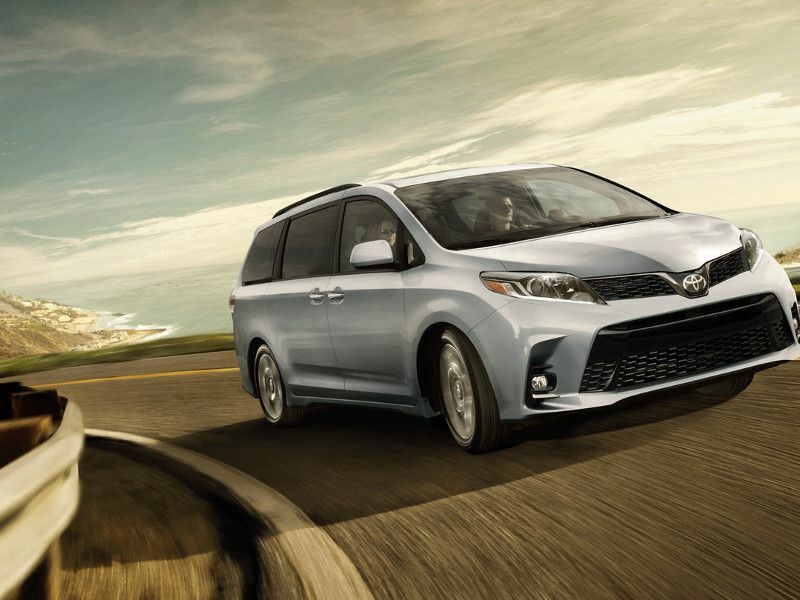 With that much power, the Sienna should be quick — and it is, accelerating from 0-60 mph in just 7.5 seconds. Merging on the highway is easy, even with the van loaded with people and luggage. But comfort is the Sienna’s priority, not speed. Around town, our XLE test vehicle was relaxed and luxurious, with a soft-riding suspension, light steering, and responsive brakes. 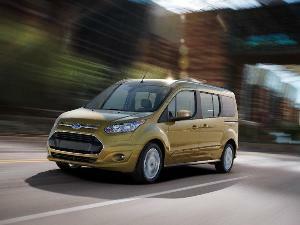 The van’s V6 engine is smooth and quiet. 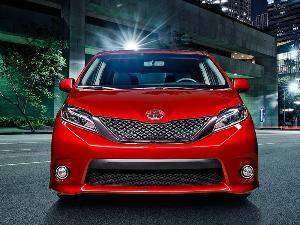 The Sienna handles well, and it’s extremely easy to drive; it’s just not very sporty. The Honda Odyssey is more fun to drive. For those looking for more performance from a Sienna, the SE trim includes a sport-tuned suspension. It sacrifices some ride comfort for more responsive handling, which is a fair tradeoff for some buyers. Google Maps tell us Las Vegas is 288 miles from my home in Los Angeles. Many people make the trip by airplane. Not the Oldhams. We packed up the 2018 Toyota Sienna with my daughter’s knee pads and libero jersey and headed for Nevada for another club volleyball tournament. The Sienna cruises effortlessly for hours on the interstate and its driver’s seat, which felt a little flat a first, proved to be comfortable as the van’s big V6 burned through an entire tank of fuel. Above 70 mph, some wind noise can be heard in the cabin, and the Toyota is affected by crosswinds out the desert more than it should be, but this is the ideal road trip mobile. Despite the wind noise, the Toyota’s interior was quiet enough for my daughter to fall asleep during the five-and-a-half-hour drive, and the van’s air conditioning system was strong enough to fight off the desert heat, which spiked in spots to over 100 degrees. The Sienna's radar cruise control operated smoothly and kept a safe predetermined distance from the vehicle ahead. The Sienna’s fuel economy is typical for the minivan class, and its V6 runs on regular-grade gasoline. The 2018 Sienna is rated 19 mpg in the city and 27 mpg on the highway, but those numbers drop to 18 mpg city and 24 mpg highway for the heavier all-wheel drive models. On our road trip to Las Vegas, I averaged 22.5 mpg. And in mixed driving, including plenty of time in Los Angeles traffic, the van dropped to 18 mpg. The Honda Odyssey is rated 19 mpg in the city and 28 mpg on the highway, but the most fuel-efficient minivan available is the plug-in hybrid version of the Chrysler Pacifica. It’s also the only electrified minivan available. Prices start about $40,000 before federal tax credits, and the Pacifica Hybrid can be driven about 33 miles on electricity alone. It has a total range of about 560 miles once the gasoline engine turns on. 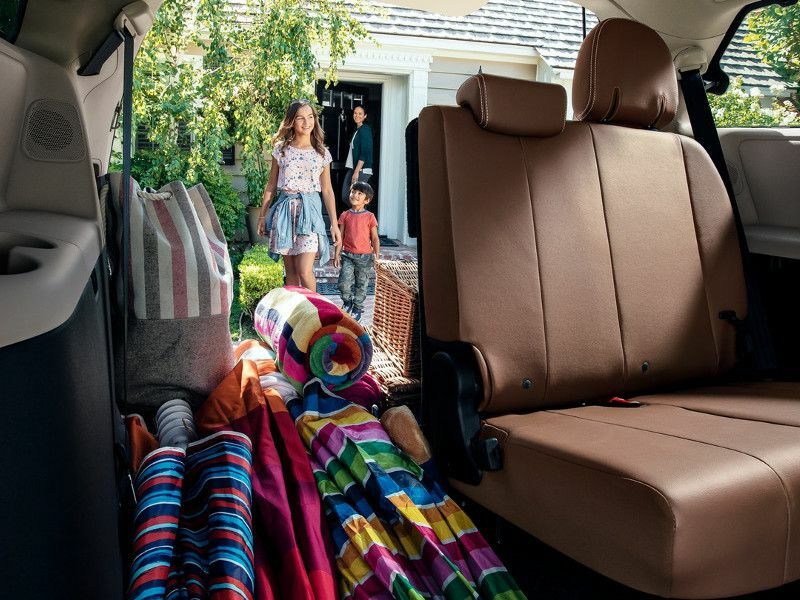 If you’re looking for maximum space for the family, the interior of the 2018 Toyota Sienna is a front-runner. 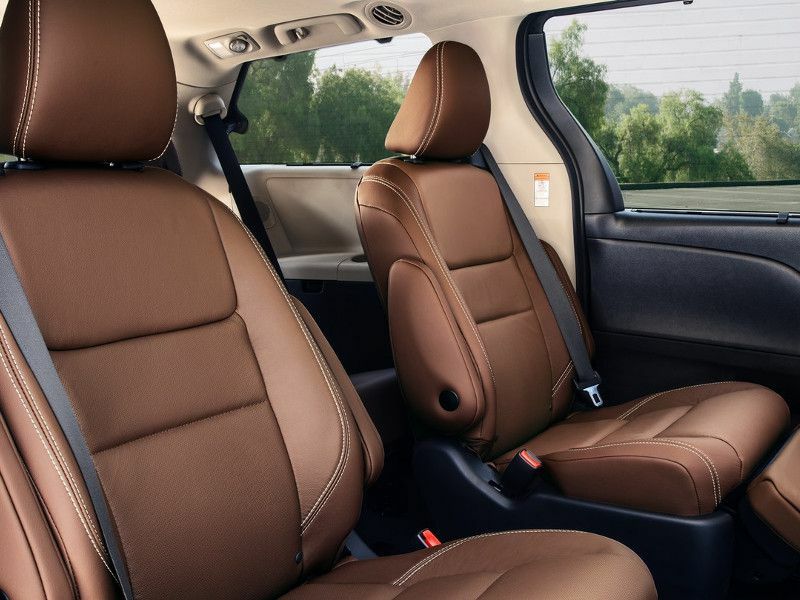 With more interior space than many of its competitors, the Sienna is enormous inside. Even with seven aboard, it doesn’t feel like it’s busting at the seams. The well-shaped second-row captain’s chairs recline, have adjustable armrests, and can slide forward or back to adjust the amount of legroom in both the second or third rows. The third row does fit adults but headroom is tight if you’re over 6 feet tall. Our test vehicle’s abundance of rear air conditioning vents and cupholders were also appreciated. The second row gets two cupholders, while there are four for those in the third row. Up front there are four. In crash testing, the Sienna received a five-star rating from the National Highway Traffic Safety Administration. Although it performed well when tested by the Insurance Institute for Highway Safety, it received a lower Acceptable rating in the small overlap front impact test. 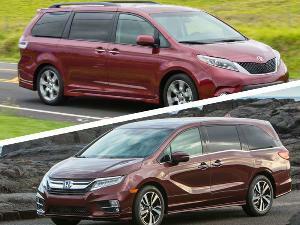 The Honda Odyssey did better in that test. After an 11-hour road trip, you know a vehicle pretty well, and the Sienna's interior will seduce you with its extreme comfort, its excellent control placement, and its luxurious features. 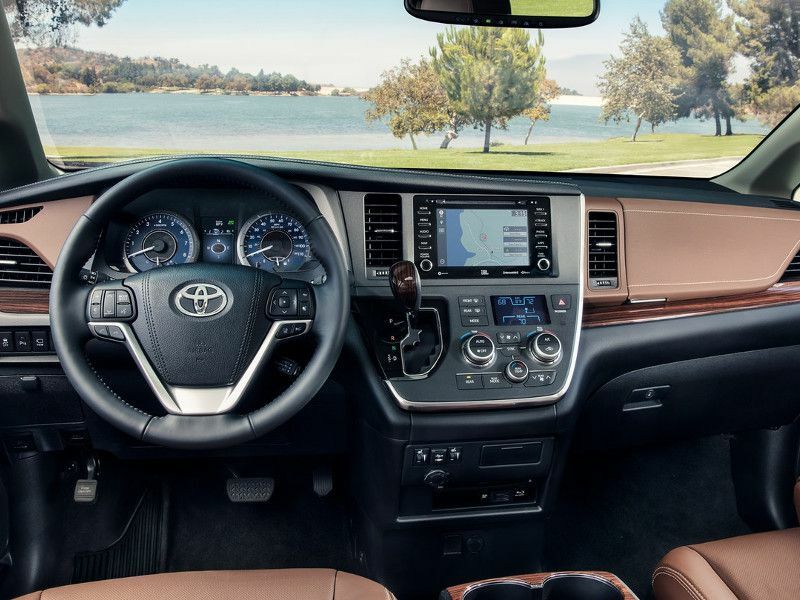 Visibility is outstanding, and the Toyota’s interior is well-assembled. There’s quite a bit of hard plastic, but the touch points are soft and it's easy to find a comfortable seating position. Our test vehicle featured heated front seats, a sunroof, navigation, and — of course — power sliding rear doors and a power liftgate. All the Sienna’s knobs and switches are easy to reach, and the 7-inch touchscreen that controls the infotainment and navigation system is simple to use. The Sienna’s blue gauges are little overly ornate, but they’re attractive and easy to read, and the glossy wood trim on the console, dash, and door panels looks rich. The Sienna’s parking brake, however, is still foot-operated which seems a bit old-fashioned. Toyota should replace it with a more modern push button system. Although the Toyota’s 7-inch touchscreen is bit small at this price point, it’s large enough, and Toyota’s Entune infotainment system is simple to operate. It offers quick responses to your inputs and plenty of features, including an app suite with popular brands like Pandora. Bluetooth audio is standard along with onboard Wi-Fi, but the system is still surprisingly not compatible with Apple CarPlay and Android Auto. On our road trip, the van’s navigation system was very useful in helping us find restaurants, gas stations, and an ATM. All Sienna’s also come with a 4.2-inch screen integrated into its instrument cluster between the van’s gauges. It displays important information like fuel economy and a redundant digital speedometer. 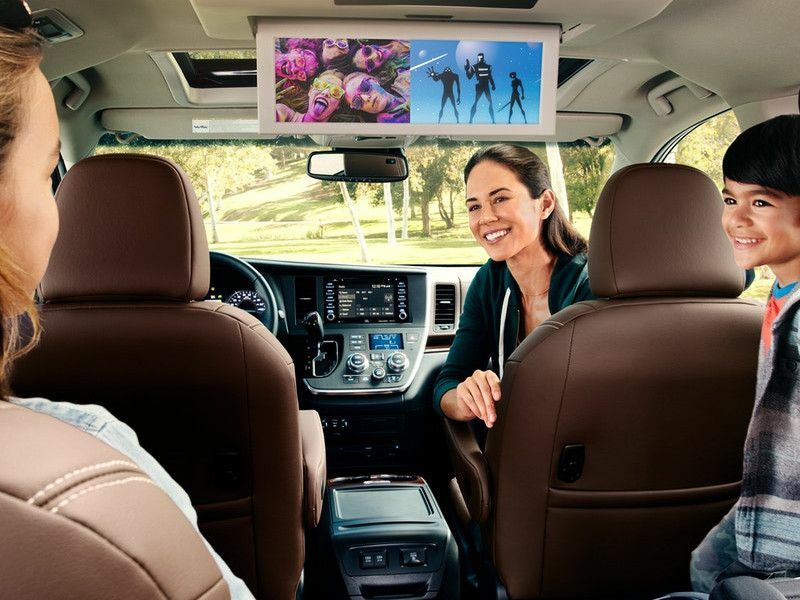 Toyota also offers a dual-view Blu-Ray rear entertainment system with a massive screen and wireless headphones, which is standard on the top Limited Premium trim level and optional on the SE. The Sienna has a huge center console bin, large door pockets, two gloveboxes, and a small bin to the left of the steering wheel, and the third row also gets two covered storage bins. 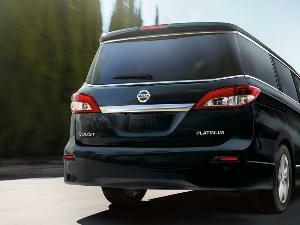 The Sienna also offers more cargo space than most of its competition and more than you get in three-row SUVs. Behind the van’s third row, it provides 39.9 cubic feet of cargo space. Folding down the 60/40-split third row opens up 87.1 cubic feet. A power-folding third row, which drops or raises the seats with the push of a button, is standard on the Limited Premium trim level. Removing the Sienna’s second-row captain’s chairs opens up a massive 150 cubic feet of space, but it’s a hassle and they need to be stored. Chrysler’s Stow 'n Go option in the Pacifica, which allows the second-row seats to fold into the floor, is a better solution. 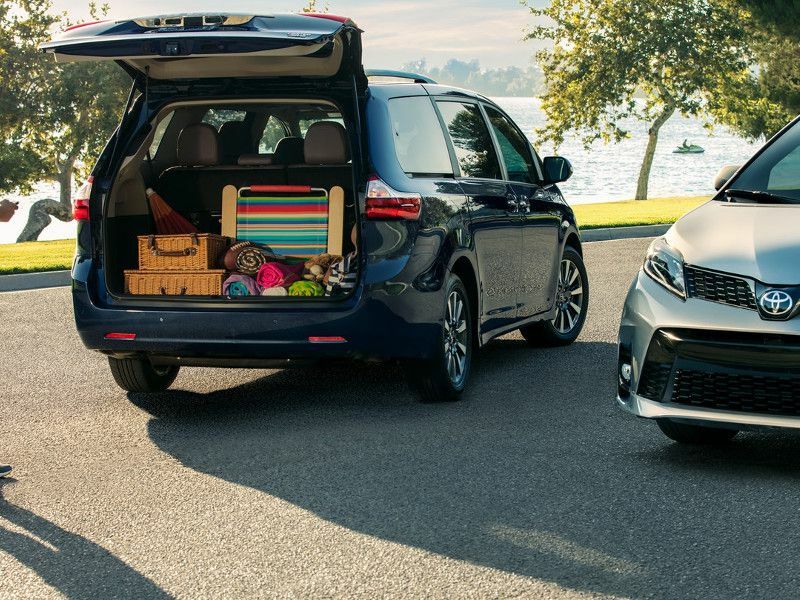 For 2018 Toyota, has given the Sienna a mild but effective facelift. It includes a new front end with a larger, more stylish grille. And this year, every trim level gets sporty side lower rockers, which were once only on the SE trim level. 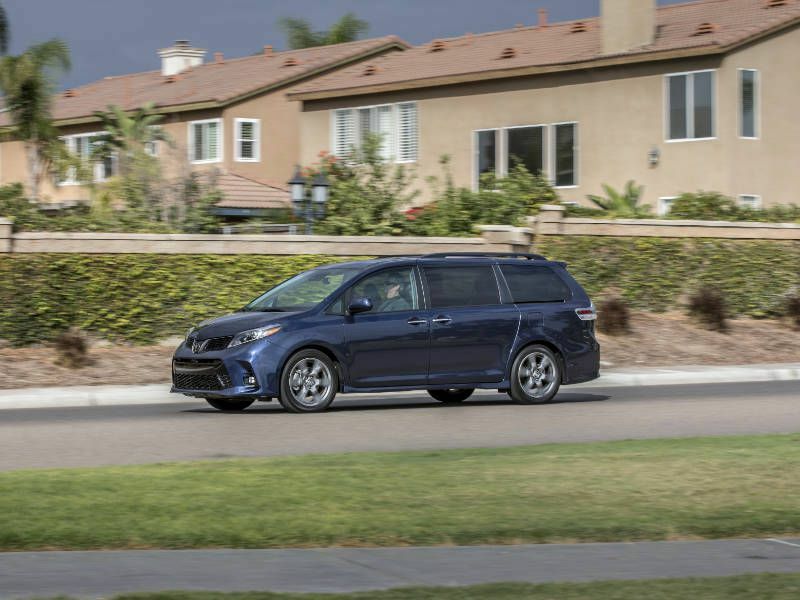 With its more athletic sport-tuned suspension, the well-equipped Sienna SE remains a favorite, but the XLE and Limited trims are attractive as well. They do cost more, but they offer extensive standard equipment. All 2018 Siennas are comfortable, powerful, and luxurious. And vehicles don’t come any more family-friendly. If you’re in the market for a minivan, the 2018 Toyota Sienna is a very desirable choice.